Introduction to Cancer Metastasis provides, in one place, an overview of organ-specific cancer metastasis and the most common sites of cancer metastasis. 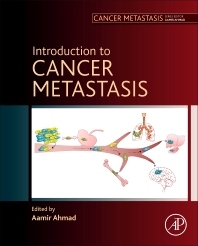 Through specific chapters on individual primary cancers, their metastasis, and chapters on common metastatic sites, this volume comprehensively informs readers about the broader knowledge base in cancer metastasis. The process of metastasis is particularly responsible for making cancer so lethal. This volume explores both metastasis from sites of origin and common metastatic sites, thus increasing understanding of both perspectives. Dr. Ahmad has published extensively in the fields of cancer research, oncology research, biochemistry and molecular biology. He is an Assistant Professor at the University of South Alabama’s Mitchell Cancer Institute. Dr. Ahmad is well known in the cancer metastasis research community. He has published 130+ articles and a number of book chapters. He is a known expert and global collaborator in the cancer research community. He also possesses extensive editorial experience, having edited 5 volumes in addition to serving as Editor-in-Chief of series ‘Cancer Metastasis’. He is also the founding Editor-in-Chief of journal “Non-coding RNA Research”. He has a Field-Weighted Citation Impact of 2.68, which shows the impressive and great importance the cancer research community places on his published articles.